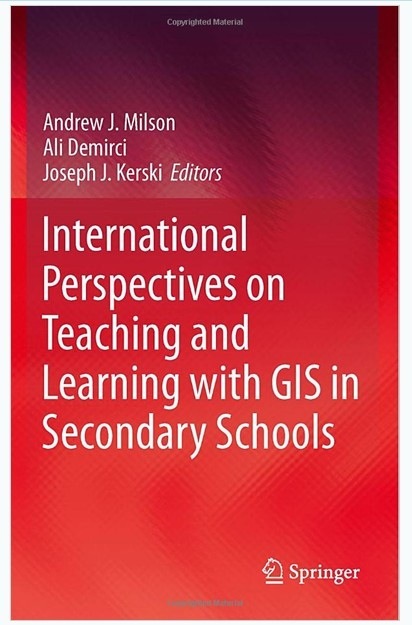 A book I co-edited with Dr. Andy Milson and Dr. Ali Demirci has just been published by Springer, entitled International Perspectives on Teaching and Learning with GIS in Secondary Schools. This is the first publication to collate a broad international perspective on the pedagogical value of GIS technology in classrooms, and offers an unprecedented range of expert views on the subject. For more information and to read sections of the book online, see the publisher's site. The authors created a series of five videos describing the book. This book brings together authors from 33 countries who profile the current status of GIS in secondary school teaching and learning in their country. We have been honored to have worked with each of our authors and to hear their inspiring stories. Each chapter includes a summary of the country’s educational context, a case study illustrating how GIS is used in secondary schooling, and an assessment of the opportunities and challenges in teaching and learning with GIS now and in the future. We are honored that Roger Tomlinson wrote the Foreword. The editors wrote a synthesis chapter where we reflect on the progress made in teaching and learning with GIS over the past 20 years, the key trends for the remainder of this decade, and make heartfelt recommendations as to what needs to happen to meet the goal of engaging all students in thinking spatially. The book demonstrates that GIS is not only a technological tool to be used in the classroom, but also a catalyst for motivation, encouragement, and cooperation in understanding and solving global problems. Geographic Information Systems (GISs) have revolutionized the way people explore and understand the world around them. The capability they confer allows us to capture, manage, analyze, and display geographic data in ways that were undreamt of a generation ago. GIS has enabled users to make decisions and solve problems as diverse as designing bus routes, locating new businesses, responding to emergencies, and researching climate change. GIS is also having a major impact in the classroom. Students and teachers around the world are using this significant emerging technology in the secondary school classroom to study social and scientific concepts and processes, to broaden their technical skills, and to engage in problem solving and decision making about local and global issues. We look forward to assembling a panel of the book’s authors at upcoming conferences, including that of the Association of American Geographers and the Esri Education Conference. How might you use this book to make a case to your colleagues and administrators about the value of GIS in education?